Stir-Fried Beef with Snow Peas, easy dinner recipes. We don't get good beef for stir-frying here (it's always tough) so I've started using ground beef. 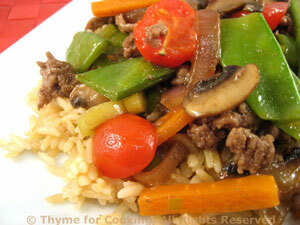 Substitute beef for stir-frying or a flank steak sliced on the bias if you prefer.